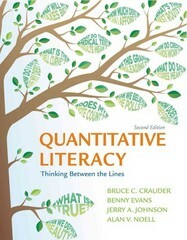 Quantitative Literacy 2 Edition "I finally understand why I need to learn some math!" says a student after finishing a course that used Quantitative Literacy. That enthusiastic response gets to the heart of how this remarkable textbook works. Quantitative Literacy shows students that they use math in their everyday lives more than they realize, and that learning math in real-world contexts not only makes it easier to get better grades, but prepares them for decisions they’ll face about money, voting and politics, health issues, and much more. The authors draw on a wide range of examples to give students basic mathematical tools— from sports to personal finance to sociopolitical action to medical tests to the arts—with coverage that neatly balances discussions of ideas with computational practice.The thoroughly new edition offers new pedagogy and more examples of math in everyday life. It is also now a fully integrated text/media package with it’s own dedicated version of LaunchPad, W. H. Freeman’s breakthrough online course space.